Too Darn Hot bids to complete his rapid ascent to the top of the juvenile ranks with victory in the Darley Dewhurst Stakes at Newmarket. John Gosden’s colt is bred to be a superstar as a son of Dubawi out of three-times Group One Dar Re Mi, making him a full-brother to a pair of top-class mares in So Mi Dar and Lah Ti Dar. 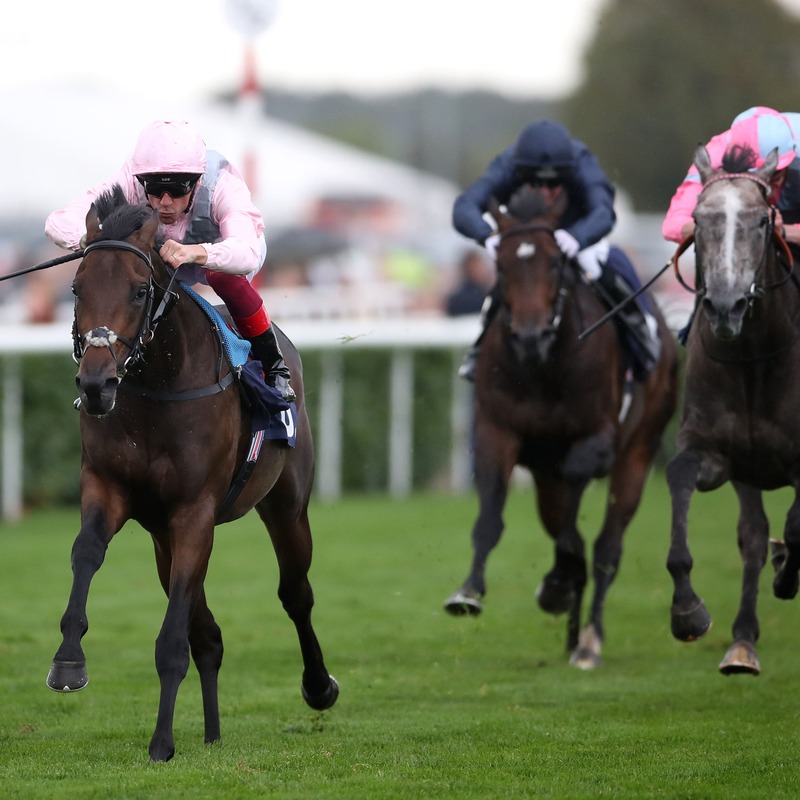 Too Darn Hot has certainly upheld family honour thus far, making a spectacular debut at Sandown little over two months ago before Group-race triumphs in Sandown’s Solario Stakes and the Champagne Stakes at Doncaster. He is a red-hot favourite to maintain his unbeaten record this weekend, but Gosden is taking nothing for granted as his charge prepares to test his powers at the highest level for the first time. Gosden said: “He has gone from winning a maiden to winning a Group Three and Group Two last time out. He’s a quick learner and is more precocious than the rest of the family, but it is a big jump. “I am not surprised that he came to hand quickly, because he is a very active, joyful horse, who has always been on the front foot and he just presented himself. He’s a happy, cheerful horse, which is helpful as they let you know when they are bouncing. Too Darn Hot’s owner-breeders, Lord and Lady Lloyd-Webber, have a policy of keeping the fillies they breed but selling the colts, as evidenced when his brother became the most expensive yearling sold at auction this year when fetching 3.5million guineas at Tattersalls on Wednesday. Too Darn Hot himself only avoided going under the hammer due to injury. Gosden added: “He is a beautifully-bred horse and he comes with a bit of story as he couldn’t make the sales with an X-ray problem and he has done well to overcome it at this stage. “Doncaster is a different track to Newmarket, what with the dip and the quick ground, but we have been happy with him. The sole Group One winner to date in the field is the Martyn Meade-trained Advertise. Second in the Coventry Stakes at Royal Ascot to the now-sidelined Calyx, the Showcasing colt struck gold in the Phoenix Stakes at the Curragh. Meade said: “It was always the plan to wait for the Dewhurst after the Phoenix, I just thought the little break would do him good. He added: “I don’t know if he’s going there as the forgotten horse, he certainly hasn’t been forgotten in my book. “It’s quite extraordinary that he barely gets talked about, because he won the Newmarket race (July Stakes) pretty easily and if he’d been drawn on the same side as Calyx and known he had to race against him he may have beaten him, too. Aidan O’Brien has won the last three renewals and this year calls on Anthony Van Dyck, Mohawk and Christmas in a bid for a seventh win the race overall. All three have claims, but the stable number one appears to be Anthony Van Dyck, who found only Quorto too good in the National Stakes at the Curragh. O’Brien said: “He’s been in good form since the Curragh. We’ve been happy with him since then. Mohawk won the Royal Lodge Stakes over a mile at this venue at the end of last month. Christmas, meanwhile, was second to Anthony Van Dyck in the Futurity Stakes and third in the National Stakes. Stepping up markedly in class is the Sir Michael Stoute-trained Sangarius, although he has made quite a splash in two starts to date and now carries quite a reputation. He was last seen winning a race at Doncaster that a certain Frankel claimed on his way to super-stardom. Like Frankel, the Kingman colt runs in the colours of Khalid Abdullah.